Séville à l'Aube is a perfume by L'Artisan Parfumeur for women and was released in 2012. The scent is floral-sweet. It is still in production. The scent was created based on a memory of perfume blogger Denyse Beaulieu. She accompanied the creating process and documented it in her book "The Perfume Lover". Sweet beewax full of orange blossom and a bit jasmine pollen. I think the addition of lavender, tobacco and olive blossom notes is what it gives it a complex creamy development connected with the sweetness of benzoin in the drydown. I don't find this one fresh at all, it is almost syrupy. Somehow it is more of a spring afternoon at Seville than Seville at sunset to me. Whenever I use it in the open space, bees are literally following me. I find it uplifting and special. Longevity is quite good and sillage can become heavy under warm sun. I pretty much just got a cloyingly sweet honey smell. The Floral notes didn't peak through until just about the time it faded. Definately not a good one for me. Edit: I tried this again a few times since my previous review and in the colder, drier weather it is more complex tha the Honey bomb I got in the humid heat of summer. I still don't like it, but I was able to pick out a leather smoky, incense thing behind the cloying honeyed orange. This is defiantly orange blossom but it's not white, or green. It's yellow and honeyed. I can see how some people would go for it. On someone else's skin it may become divine. On me it was not so good. I could see this being a favorite orange Blossom of the people whom gravitate towards Cuir de Russie, Tabac Blond, and Black Orchid. It gives off the same vibe when it's not a honey bomb. I am a bit nuts for orange blossom, so it is no surprise that I love Seville a l'Aube. Unlike Ellie Saab, this does not turn too musky and synthetic with continued wear and instead remains true to the flower. Seville a l'Aube actually starts out more acidic/citrusy than I like. But as it continues to dry down, it starts to smell like incense to me and apparently others as well. I happened to be in the car with my father when I first wore it, and he couldn't detect any flowers at all. He remarked that I smelled like incense, which I took as a compliment...until he said it wasn't a compliment and that he thinks it's weird to smell like incense. Oh well--I don't wear perfume to please my father. If you have ever smelled Andy Tauer's Maroc Pour Elle, that could give you an idea of the incense effect I am talking about. Despite the incense, this perfume is not dark and smoky, rich or intense. It reminds me very much of the one and only perfume released by Frederick Fekkai, Sensuelle. Both perfumes are extremely high-quality orange blossoms on a honey-like base. 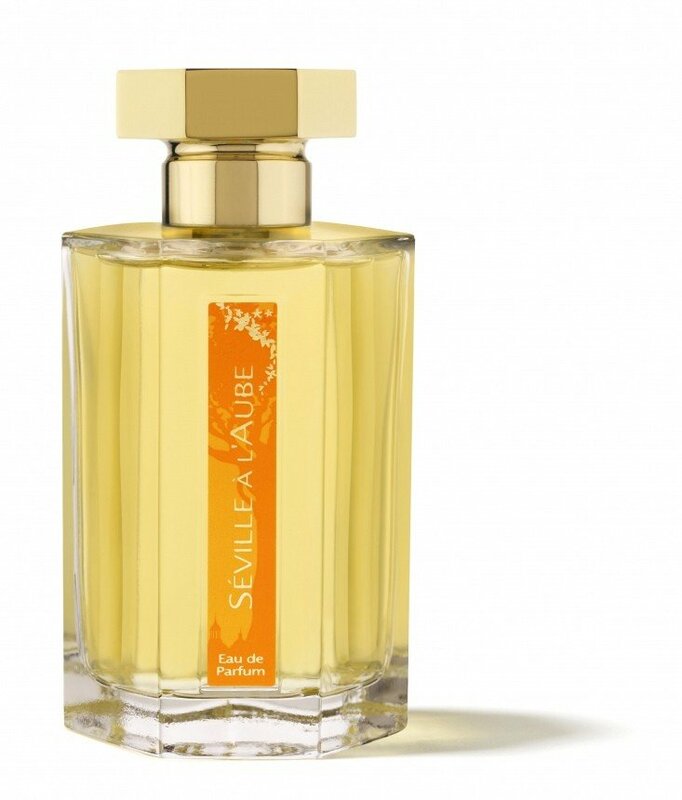 Seville a l'Aube is an orange flower perfume that is easy to wear year round--clean enough for warm weather and thick enough for cooler weather. Bertrand Duchaufour the nose behind CDG Avignon, which I have tried but was not too impressed after two wearings. I rate Avignon 7/10. But he astonished me when I sampled his Timbuktu, led me to buy a full bottle. It earned many compliments every time I wear it and Timbuktu has climbed up to my top 10 best perfumes rating it 9.5/10. This is now a tie as per my evaluation oh Duchaufour's creations. I can't wait for my Dzongkha to arrive. Today my sample on Seville arrived along with 6 more samples, freebies from an online store as gifts from being their avid customer. This is my take on Seville to please my curiosity. A dab on my right arm and I felt already its beastly orange blossoms. It smells strong but good on top as I smell the orange blossoms, white florals with a sharp tone of beeswax, that added light sweetness. There is a faint lavender note coming in and out. But after 20 minutes or so, reaching the heart, I felt it to be slightly cloying. I can stand this cloying note but I can't distinguish which one it is, maybe carnation, as I am not accustomed to its scent plus I don't remember having a carnation note on my perfumes. The heart didn't stay long and an hour after, the scent was pleasant but not original, not even outstanding. I know I have smelled this dry down before. If there is leather here, I didn't get any out of it. I smell paper, a stationary but very light yet nice. But I have smelled this dry down better on one perfume that I admire. Seville is a love/hate perfume. A loud & potent charming top, a less interesting mildly cloying heart and a lightly pleasant dry down, not unique but appealing. It is suitable for spring and fall on an afternoon to evening occasion. This is best & would get more compliments on a windy outdoor walk, garden setting event plus would attract female noses. I don't think, as a man, that I will turn my head to a woman wearing Seville. I would rather turn my head on a woman wearing a heavier, more refined and wonderful dry down, like Alien. This is Seville's resemblance, a heavyweight and way ahead more beautiful base scent. My rate would be 7/10. Admirers of Alien may like this greener & lightly floral fragrance with a citrusy top. 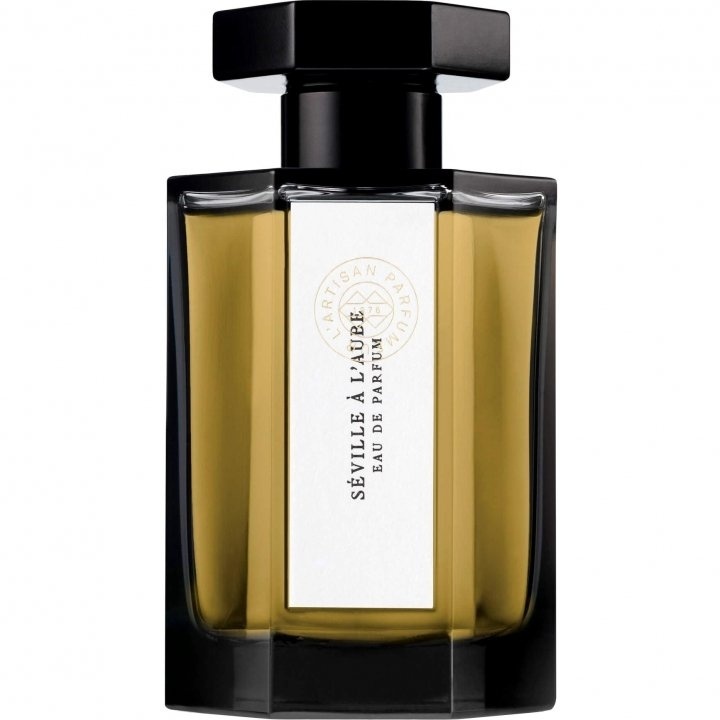 Seville a l'Aube opens with a very green petit grain before the starring orange blossom emerges slowly to dominate the rest of the scent's development during the early middle phase, supported initially by a slightly indolic jasmine and lavender floral undertone. The orange blossom continues to gain strength further late while the indolic jasmine begins to recede, now gradually replaced with relatively subtle lemon-like frankincense emerging from the base to join the continued lavender support in the dry-down. Projection and longevity are both excellent. I have always had a problem with orange blossom scents and sadly Seville a l'Aube is no exception. I enjoyed the initial green petit grain open, but the enjoyment was abruptly halted when the slightly medicinal orange blossom first appeared... and then grew and grew. Making matters worse is the underlying indolic jasmine floral undertone that permeates the orange blossom early. I love jasmine in its more sanitized form, but indolic notes like the jasmine used here (even if it is rather subtle) are just not my thing. Add in the use of lavender which is yet another of my least favorite notes and you have the trifecta of notes I dislike the most all here. At the end of the day I really wanted to like Seville a l'Aube as I am a big fan of its nose, Bertrand Duchaufour, but with the ingredients used it was all but a forgone conclusion I would dislike it, and dislike it I do. The scent is obviously well-made, and if you are an orange blossom fan that likes scents like APOM pour Homme you may want to seek it out for a sniff and see if you enjoy it more than I, but while it has superb performance I can't recommend Seville a l'Aube, awarding it a below average 2 to 2.5 stars out of 5.